Now is a fantastic time to begin learning astronomy. Never before have there been so many different ways to view the universe right from your own backyard- or anywhere. But when you’re just starting out, how do you select your first telescope? Here are some things to consider so your stargazing experience is unforgettable. Where you intend to study the sky helps to determine which telescope will be best for you. If you’re planning to stay in your backyard, then you will probably do fine with a larger, heavier scope. If you’re planning to take it out to the country away from the city lights, then you will probably need one that is lightweight and portable. If you’re planning to have it with you on long road trips, then you probably need one that is compact. Knowing what you want to do with your scope and how you can store it will help you figure out which one best suits your needs. Also, ask yourself how complex of a telescope you want. Different scopes require different amounts of set-up and adjustments so it’s important to know how much time you want to spend on it before you begin observing the sky. If you’re thinking you might use your scope only occasionally for short periods of time, then a simple one would be fine. But if you’re planning to study the sky in-depth and dive deep into astronomy, then a scope with extra fine-tune adjustments and features would be better. Keep in mind, though, that the more complex it is the less time you might spend looking at the stars. Most beginner astronomers mistakenly believe that a telescope’s magnification, or “power”, is the most important feature. But actually, the most significant factor is the aperture, which is the optical diameter of the light-gathering lens or mirror. This is what allows you to see faint objects with the finest of detail. It’s wise to avoid telescopes advertised with amazingly high magnification because the common result is that the magnification won’t be compatible with its optical diameter and you’ll end up looking at only big, fuzzy objects. As a rule of thumb, the maximum amount of useful magnification is about double the measurement of the optical diameter in millimeters, or 50 times more in inches, and this is only if the optics of the scope are perfect enough. So if you saw a four-inch scope made of high quality, you’ll do fine if its magnification is less than 200x since even Saturn’s rings can be seen with only 75x under good observing conditions. But if you buy a cheaply made one that was advertised with an incredible 600x, for example, you’ll continually struggle to get a clear shot. When you’re shopping, look for a scope that has an optical diameter of at least 70 millimeters minimum. It might also be listed in inches, which means 2.8 inches is minimum. In this case, bigger is better so you can see far, distant objects with greater detail and clarity. Diameters smaller than 70 mm will likely be required to be physically bigger (and perhaps heavier) overall to capture the same view as ones with larger diameters. You should also be aware of the scope’s overall focal length and the focal length of the eyepieces to get a true sense of the scope’s magnification. The overall focal length is the distance from the primary lens or mirror to the image it’s creating. It’s usually a number between 400 and 3,000 mm and can be found on the side of the scope. The focal length of the eyepiece is also expressed in millimeters. You can use these two numbers to determine your scope’s magnification by dividing the overall focal length by that of the eyepiece. So if your scope has a focal length of 500 mm and an eyepiece that’s 25 mm, the magnification is 20x. The magnification can be altered by changing the eyepiece and its focal length as desired. There are three basic types of scopes: refractors, reflectors, and compound (catadioptric). These types of scopes are the most recognizable thanks to its use by many pirates over the years. It has a lens at the front of the tube and an eyepiece at the back. Light is focused through the lens to create an image at the back which you view through the magnifying eyepiece. This scope is popular for several reasons: (1) They can capture high-contrast images with high magnification, (2) the lens stays in alignment more often than other scopes, which makes them more durable and easier to use, (3) many come at a reasonable price. However, be aware that as the optical diameter increases, the price also increases. For a high-quality scope with great optics, look for one that is called an apochromat. Lesser quality scopes are called achromats. These scopes use a mirror instead of a lens to gather and focus light. There is a concave shaped, primary mirror at the bottom of the scope and a small, diagonal, secondary mirror near the top that directs the light from the primary mirror to the eyepiece, which is usually on the side of the scope. This style of scope is called a Newtonian scope, named after Sir Isaac Newton who invented it. There are lots of value and advantages here. Since it has a larger optical diameter than a refractor scope at the same price, you’ll capture many high-quality and contrasting images. Newtonian scopes are well known for its ability to take “correct readings” rather than a mirror image so that you can accurately compare what you’re seeing to what’s on a star chart. A simple kind of Newtonian scope is the Dobsonian. They are portable and very easy to handle. The tube is commonly short enough to fit in a car, has a low center of gravity, and the eyepiece is at a comfortable height after the scope is mounted. They’re also relatively inexpensive. These scopes often require maintenance. Its mirrors can move out of alignment and require adjusting, especially if the scope is moved periodically. You can do this yourself and it gets easier once you get the hang of it. Also, its open tube allows dust and dirt to settle on its optical surfaces, so you will have to clean it from time to time, even if it’s stored properly. You will also need to send the mirrors out for recoating of its aluminized surfaces about every 10-20 years, more often if you live in an area with high pollution rates or near the ocean. Reflector scopes are a great way to enter the world of astronomy and learn more about what’s involved. As the name suggests, a compound scope combines the features of refractor and reflector scopes so it has a high aperture with a long-range focus. Specifically, it combines both lenses and mirrors to allow for a more compact tube design by optically folding light. It’s very lightweight, mounts easily, and can be carried without difficulty. The two main types of compound scopes you’ll see are called Schmidt-Cassegrain and Maksutov-Cassegrain. There a few things to be aware of if you’re thinking of buying a compound scope. • It has an open tube, which means that you will have to adjustment the optics from time to time. • It has a narrow field of view. • The optical diameter is not quite as good as reflector scopes but is better than refractors. • It has a secondary mirror that can lower its performance because of its compact design. • Moisture can easily enter through the corrector plate at the front of the tube, so you will need to attach a protective collar or extension piece over the exposed plate. • It is usually much more expensive than other types of scopes. Compound scopes take great images and have many technological advantages such as an ability to utilize computer pointing and photography programs, which is why it’s a popular choice for astrophotographers. Also, the tube is sealed, which means dirt and dust cannot get in, making maintenance a bit easier. If you have the means, these scopes can be great for the average beginner in astronomy who is looking for an all-purpose scope with versatility and portability. Some scopes have robotic motors that allow you change its position remotely by computer. These are called “Go-To” scopes. They are fairly high tech, even including GPS in some models. They can be useful to advanced astronomers; however, they tend to be less precise due to the many moving parts and the risk of something malfunctioning. Be aware that there are Go-To scopes that are relatively inexpensive, but they tend to have smaller optical diameters than scopes that are considered entry level and are similarly priced. In other words, if you’re just starting out, you may be wiser to invest your money on a traditional scope with a larger optical diameter than spend it on a Go-To. Even a good scope won’t do you much good if it doesn’t have a mount you can use. Good mounts pivot and move smoothly, and are very stable. It should allow you to position your scope without any hindrance and have a good range of motion. It also shouldn’t vibrate or lose its aim when you let go of it after you’ve found what you’re looking for in the night sky. There are two types of mounts: altitude-azimuth and equatorial. The altitude-azimuth, or “alt-az”, is similar to a camera tripod. It can move up-and-down and left-and-right. It allows you to make smooth, small adjustments, which is important when you’re using high magnification. One unique type of alt-az mount is a Dobsonian mount. It is fairly inexpensive, has a low center of gravity, is made of simple construction materials like particleboard and Teflon, and is pretty easy to set up and use so you get a lot of value for your money. An equatorial mount can also move in two directions, but its main ability is to track stars on a single axis, specifically the Polar axis. Equatorial mounts are usually heavier, larger, and more complex to set up than alt-az mounts. However, once you’ve learned how to determined polar alignment, it gets easier to use since you’re only moving your scope along one axis instead of two like an alt-az. This makes the equatorial mount preferred by most astrophotographers. When you’re ready to buy a mount, a Dobsonian alt-az mount will probably do just fine for a beginner astronomer until you learn the finer details of stargazing. But when you feel your skills have progressed enough, consider an equatorial mount since it is much more accurate. When you’re ready to purchase your telescope, always choose one you know you will use regardless of its particulars. Consider how you want to use it and where as well as your budget. You don’t have to spend a lot of money to get started and have a great viewing experience. You can find many quality scopes retailing for less than $250. You might even think about purchasing your first scope second-hand. Remember that you don’t have to figure it all out alone. 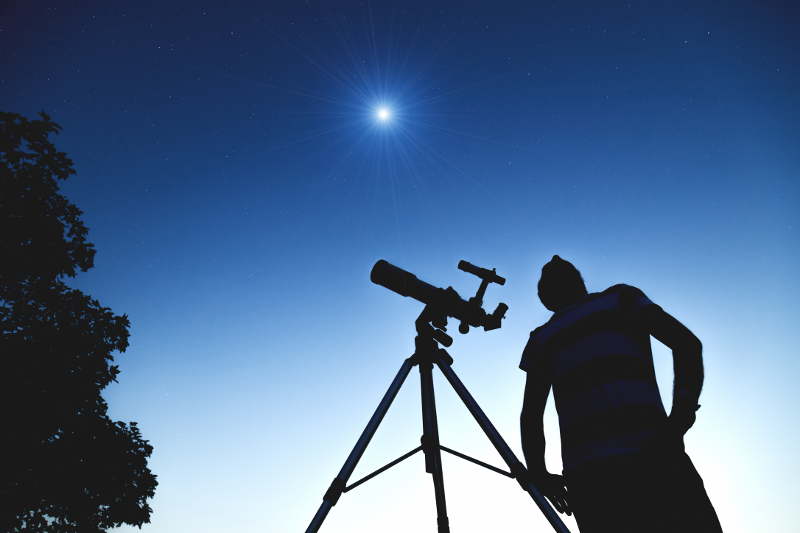 Reach out to your local astronomy club or planetarium to find out when their next observing night is scheduled. The people there can answer your questions, offer advice, help you learn more about your equipment, and teach you how to study the sky. Owning a telescope will open up a whole new field of fun and adventure for you and your family. With a little education and a lot of curiosity, you’ll be ready for a lifetime of celestial wonders as you explore the exciting world of astronomy.